Atkins Induction Day 3 – I Don’t Exercise – Or Do I? On Wednesday I received my weekly email report from my Fitbit – a little device about the size of a clothes pin that tracks exercise by monitoring your steps, the flights of stairs that you climb, and general overall motion to try to put a number to your daily activity. Then, when in close proximity to its base station, it phones home with the latest numbers and tallies the day’s totals. It also syncs with my calorie-tracking app to gauge this against the number of calories eaten. But I don’t ‘exercise’. I don’t power walk, swim, bike, snorkel, bungee-jump, spin, jog, Jazzercize or limbo – or any other activity that might even resemble an act that requires gym equipment, sweat pants, or sneakers strategically chosen for the precise exercise activity they are designed for. My motto is: whenever I get the urge to exercise I lie down until the feeling passes. Usually with a good book. This usually gets a laugh, followed by a head shake. But it’s also the fact, Jack: I do not have any form of activity that would require me to visit a sporting goods store or a gym. This is supposed to be a no-no on a diet. You can’t lose weight without exercise…can you? I have. I can. I will this time as well. I’ve proven over and over that exercise isn’t necessary for weight loss. I will not say that this is optimally healthy, but I do seem to hear from my exercising friends about their ‘sports injury’, months of physical therapy, and as I age, the hip and knee replacements. So exercise isn’t entirely healthy itself. Now, when I start my diet the thought of exercise never occurs to me – I focus on the food intake and perhaps a bunch of other things, but not exercise. This isn’t a recommendation – heck – I don’t even recommend anyone read this blog. I’ve done little to promote it, write haphazardly, and frequently document my dieting facepalms interspersed with poorly researched nutritional navel-gazing spiced with banal comments about my day. But you are here reading this and I’m here writing, so I’ll continue with my point. This is only a part of what it tracks. It has the ability to track the soundness of your sleep – but I sleep like a baby – so I don’t bother with that. 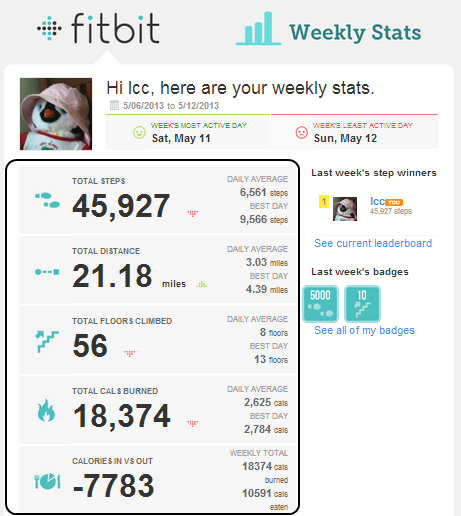 What it DOES tell me is interesting, though: despite my dedicated avoidance of formal exercise of any sort, I apparently walk over 20 miles per week, climb over 50 flights of stairs and roughly burn 2,600 calories a day while avoiding it. All that little stuff that I do while avoiding exercising – doing dishes, putting out the trash, running up and down the stairs in the morning before leaving because I invariably forget something, walking in to work and fetching coffee at irregular intervals from the coffee maker – adds up. So perhaps ‘exercise’ as some formal ritual that gets performed each day using specially designed equipment, clothing, and perhaps a gym membership isn’t necessary to get exercise. Perhaps you are already exercising and don’t know it. Maybe you, too, can just get by with the exercise that occurs as you live your life while you focus on your diet. That’s why I use my Fitbit – to remind me of this. Speaking of diet, after destroying my ketosis with carbs the other day, I once again attempted to follow the straight and narrow. The day at work was somewhat quieter than the previous one, but I was still busy from a little after 8am to 6pm. I brought in hot dogs from the BBQ over the weekend and had 3 of then, naked, all by themselves, throughout the day along with a yogurt. I also had cream in my coffee. In the evening at home I threw some chicken thighs on the grill along with my last pork burger and ate maybe 4 ounces of the thighs with tablespoons of sour cream and the pork burger with a slice of low carb bread and some low carb ketchup. I also had maybe 3 ounces of hard dried sausage smuggled back from the Caribbean We bought it on vacation from a friendly gentleman in a Panama hat from Provence who flew to the store there to hawk his farm’s sausage and enjoy the weather, no doubt. Delicious stuff. My wife came back late and had some of the chicken thigh along with other eats and I sat with her and talked. I did avoid mindless eating at this point except for a few green olives and a few pieces of pickled garlic which I hesitated on because I might reek of garlic today. Oh, well. It supposedly keeps vampires away – maybe it is effective on coworkers as well. There were some of Brad’s Vegan Kale Chips as well. We have plenty. There was a sale of this ridiculously expensive stuff – 1/2 off – and my wife bought a case – saving another 10%. I like it, though it is a bit high in carbs. While we talked I lovingly fondled an apple she had bought but avoided eating it – too healthy perhaps. If it was a sack of cookies, however, I might have been a goner. I ended the day with a chocolate-covered marshmallow – my only ‘giving in’ and hit the sack not particularly hungry. Calories: 1,532 – a little low for me, but certainly not in some zone of starvation. Fat: 109 (65%) – Too low for me. More fat! Net Carbs: 25g – Not bad compared to yesterday. I didn’t bother to count the chocolate marshmallow because I’m lazy, but a quick check right now tells me it was about 7 grams of carbs and 40 calories – I’ll live. Protein: 99g – Right about where I want to be. My weight this morning inched down to 209.6 and the blood glucose is 117, even with the metformin last night I took with my vitamin. It’s not a terrible number but not a great one either – but I can live with it.